The JMA has updated their seasonal outlook and it has a similar look in the NE PAC/N.A. when compared to the CFSv2. Ridging along the west coast suggesting a +PNA pattern. It also looks wet for a lot of the CONUS east of the Rockies and the SW. Encouraging signs for a colder/snowier winter for the central CONUS. 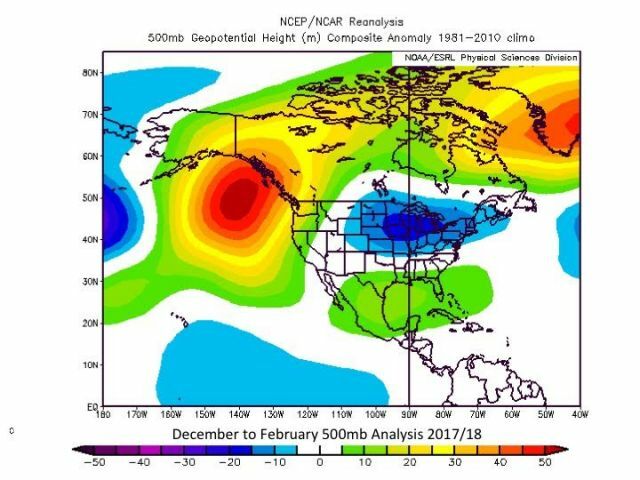 International Research Institute for Climate and Society (IRI) is suggesting a pattern favorable for snow lovers. 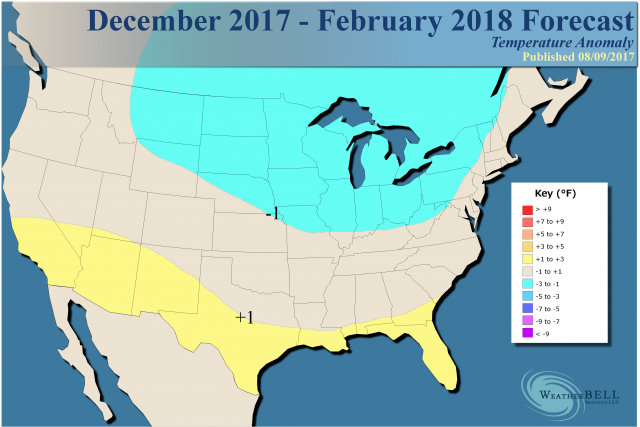 I thought about creating a separate thread for those who want to have a discussion regarding our upcoming cold season. It would prevent clogging up our summer month thread so as to not interrupt those who enjoy summer-like conditions. Having said that, chances are increasing that we may have another La Nina Winter season. 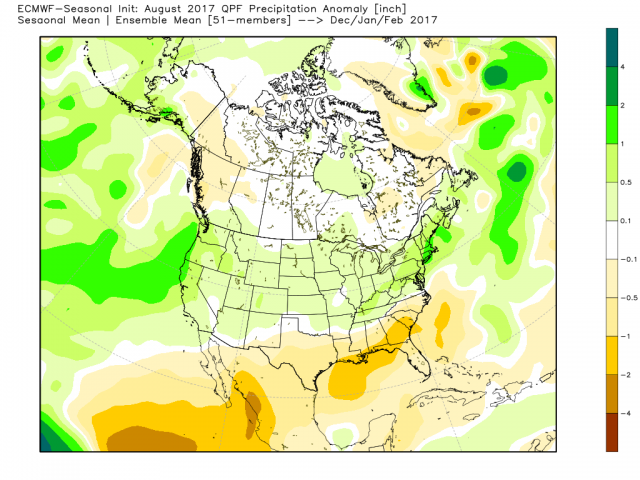 The CFSv2 is showing a stronger signal, along with several other models that are trending that way. How strong does it get??? That is a good question. I read somewhere that the Euro seasonal was showing a variable NAO and you could see here that the CFSv2 is honing in on a +NAO which would not be ideal. The best time of the year is the first discussion of winter possibilities! That NMME is eye-candy for MI qpf-wise. Just need the cold to dominate, or at least be "in sync" like 07-08. Those on Amwx are cheering on the prospects of a similar season with all the action S Lakes and OHV saw ten yrs ago. I think the first snowfall in Marshall hit dbl digits. That's an awesome kick-off around here. Yes, it's always fun to look ahead and even more so to see encouraging signs of a cold and snowy winter. I just feel like you can always find encouraging signs if you try hard enough (kind of like how you can always spin statistics in a certain direction). Weren't the last two winters supposed to be off to a fast start and be cold and snowy only to turn out to be almost non-existent for most of us? For the sake of learning - can the active/knowledgeable posters also include how an opposite/contrary scenario could happen? I don't just mean for the winter outlook, but also day to day once we are actually in the winter season. For example - A, B, C all suggest a cold and dry week, however if X, Y, Z were to transpire, then that could mean.... you get the point. I give props for this post. I wholeheartedly agree that I need to do a better job of covering both points and counterpoints in my own posts. I know I have some bias also and have worked pretty hard over the last few seasons to remove that and write in a more objective way regardless of what I like or dislike. I'll continue to try to do a better job of that in the future also. Good post. In this stage of the game, I always like to post all the models (even the ones that are not showing a cold winter)...For instance, the CFSv2 maps above show largely above normal temps for the majority on the CONUS. Now, there could be a lot that can go wrong to offset the positive, or rather, snow/cold conditions. 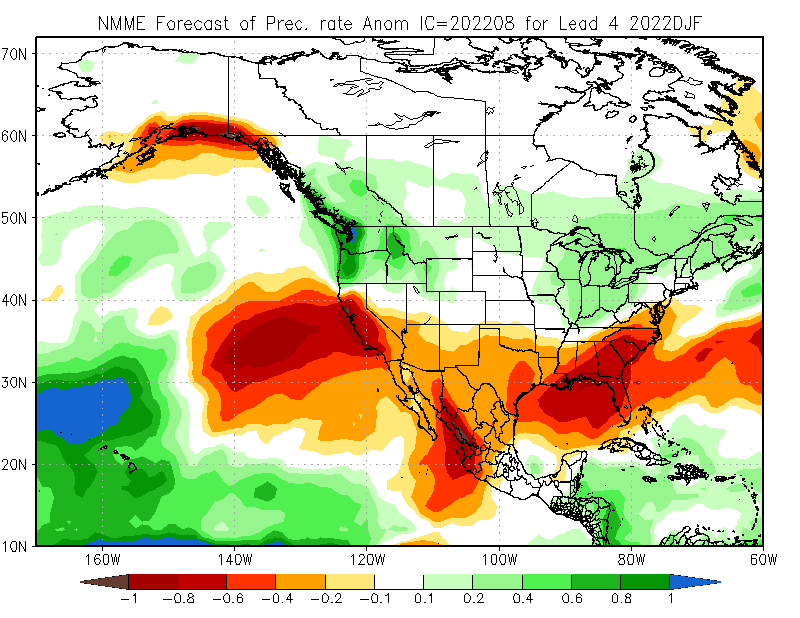 For instance, the warm pool building in the NE PAC could vanish (like last year) over the next couple months. Second, we can have a mod/strong La Nina which would not be a beneficial storm track for the Midwest/Lakes region. 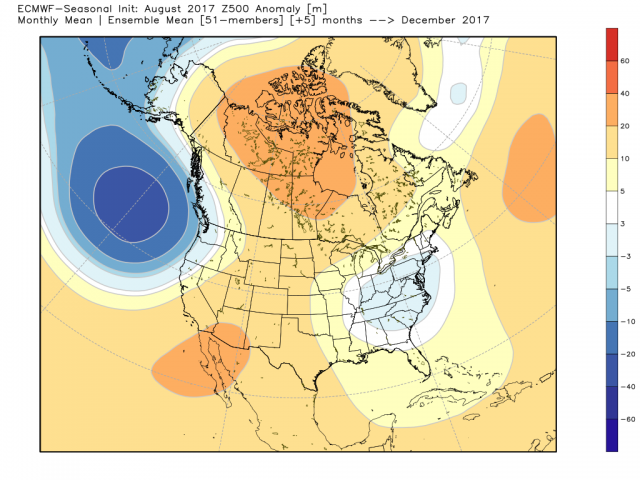 Third, even though we have blocking present now in late summer and which could very well continue into the Autumn...however, that could flip in a heart beat once we get into Winter (like it did last year). So, yes, a lot can change but we have to see how the new cyclical pattern sets up in Oct/Nov for me to truly get a grasp on how I believe next cold season will play out. Until then, enjoy watching the new model runs come in and enjoy the ride! 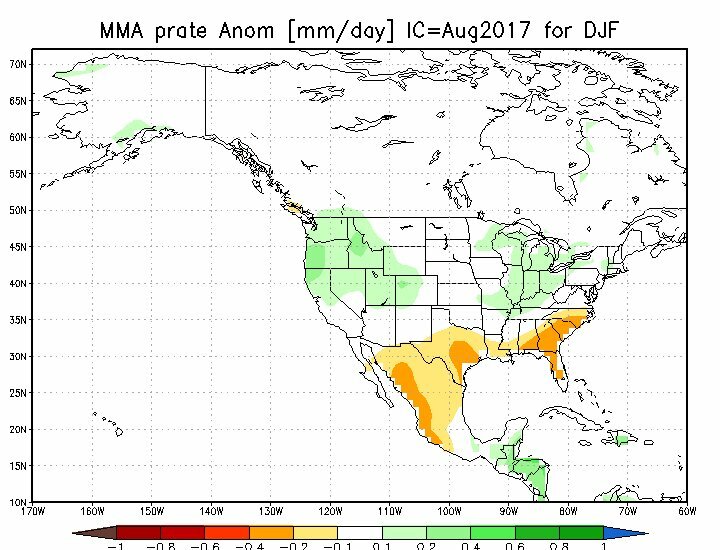 As for blocking, so far through Aug 14th, the QBO is solidly negative and forecasts suggest it to continue for the foreseeable future. Meaning, if a -AO/-NAO pattern remains throughout the Autumn months it should continue through Winter. 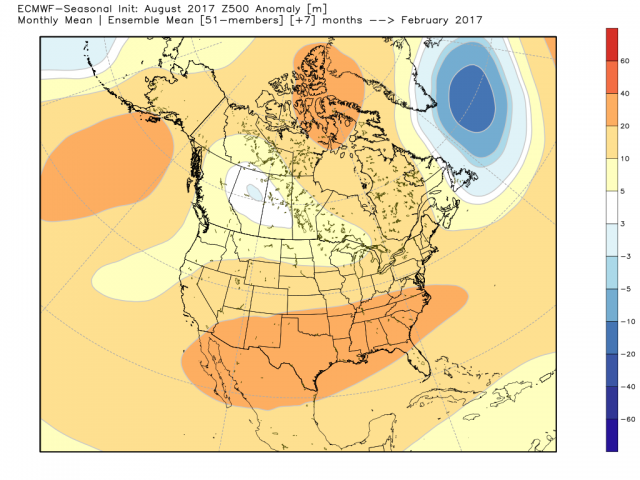 Last year, we did not have a -QBO which prob offset the -AO pattern we had last Autumn that suddenly flipped positive DJF. Nature will do what she pleases and I'm sure it will be another learning experience for myself on what actually transpires. I love to learn everyday how all the variables in meteorology work together to give us the weather that we all live in. We have to enjoy the weather, because the weather, will always be with you. 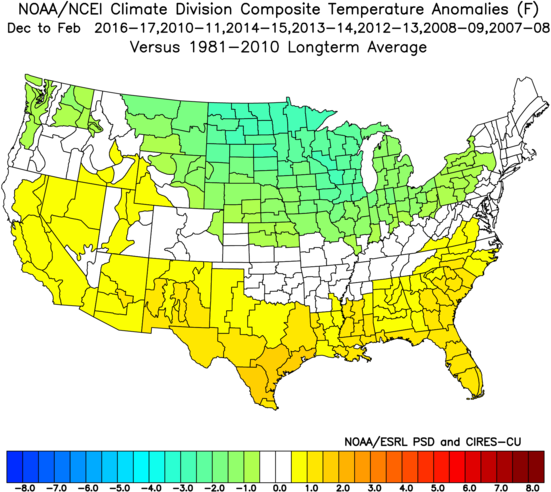 CPC has updated their seasonal outlooks and there are some changes from last months run. Firstly, next month has trended much cooler comparing to what it was showing during last months run. This makes sense since we have seen the CFSv2 flip much cooler since the beginning of August when this trend began. Moving forward, just looking at this map below for SON, you have to wonder how much of this is taking into account a warm bias??? If you torch the AK region, desert SW and even parts of New England...the natural response would be lower heights or cooler conditions across the central CONUS. You can sorts see the signs if you ask me. The idea of an early and fast start to Autumn up near the Archipelago regions of Canada are on the table. Trends in the CFSv2/CFS show continued troughing to begin developing as we head into September allowing cold air and an early snow cover to build up. 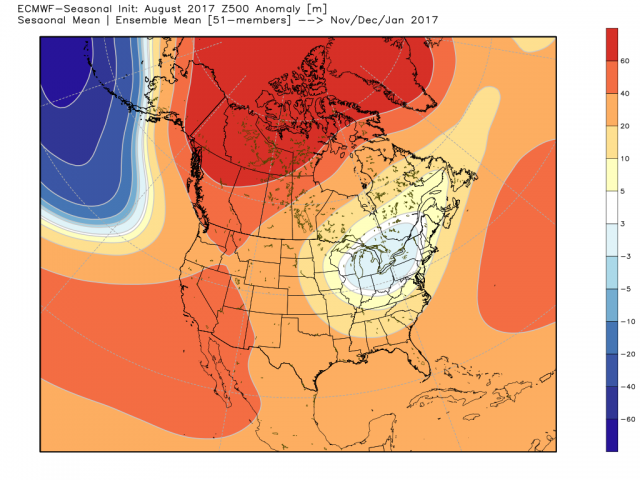 If less snow falls across AK during the Sept/Oct period, I think it will set the stage for ridging to become a player for the new cyclical pattern. Just an early thought on what I'm seeing. I assume you mean west coast ridge? Yes, and you could also add the Alaskan Ridge. Got ya. One would think if that were to pan out it would be more troughy for the CONUS. Interesting stuff on the table. Couldn't agree more. I think both you and I will be in pure autumnal mode by Labor Day weekend! Thanks guys - always appreciate your contributions. After my mom mentioned a few days that she saw a few leaves changing Ive also noticed quite a bit myself. Some have already fallen. I realize its prolly from the dry weather but if we get some cool and damp days I can see quite a bit more color and falling leaves in the next few weeks. The shortening days will also be playing a big role. Anyone know how much daylight we've lost since June 21? 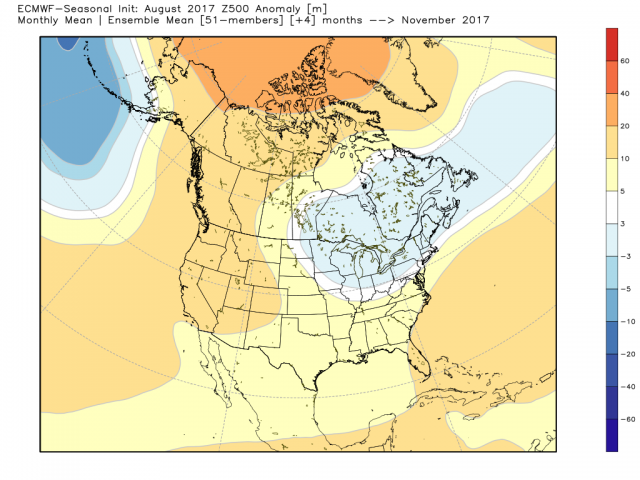 If the JMA & CFSv2 weeklies are right, I'm expecting to see widespread Frosts...maybe Freezes up north for Week 3-4...certain variables seem to be aligning for a dislodge of Autumn cold. I mentioned before, that I had a hunch we would probably see our first Freezes a bit earlier this year. Looking like that is a real possibility. We've been talking about the state of the QBO on here and I just read from another met his comments regarding the new ECMWF Weeklies and the magnitude of blocking showing up. The high latitude blocking next several weeks likely result of QBO transition to negative. Leaves a lot to be desired in the coming months. With that being said, look out for 2 significant shots of cold down the central Plains where it has been coldest thus far this August. Very interesting pattern setting up. Pretty much going with 2000 as my top analog so far with 2008 in a close second. I am hoping for a fast start to Winter ( early Dec ) and have it last thru early to mid March. Tbh, I don't mind a small break in January. Iirc, all-time snowiest in the BC/Marshall area with the official site hitting 55" on the month! Yeah, I'd do that again - if pushed! That was a share the wealth type of Winter. Lincoln had a rocking December as well. If it goes wrong then I'm leaning towards a year like 2012-13.
last Fall was about the best weather I can ever recall for Sept-Nov. It was perfect and warm. I'd love a repeat of that, but that seems very unlikely. The implication is there would be a fast start to winter that hits and holds. While last winter December tried to get cold, the winter before we saw it in January during the the Super El Niño. In 2014-15, it was November and then late January into February. This winter has the look of more like 2013-14, that had a faster start. Looks like a coast-coast active storm track like some of the other models that have been shown..
Joe D'Aleo's Pioneer Model (FWIW, it nailed the '13-'14 Winter)...something is brewin' for this winter...I'm seeing some intriguing signs that it can deliver for a lot of us on here...I'd like to see what the new cycling pattern has to say by end of November. Sounds like JB is thinking like me. I haven't had WxBell in 2 or 3 months so I had no idea where his idea was headed. The maps shown are pretty much dead on with what I was thinking from my earlier post about 2000-01, 2008-09 and now 2010-11 and 12-13. 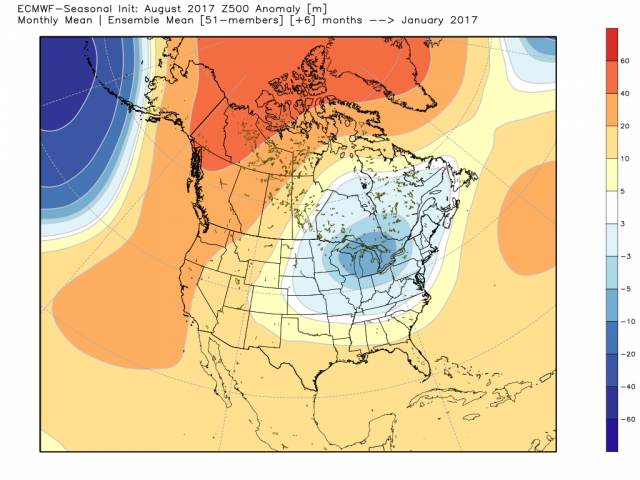 Don't really see this past winter's pattern coming back this year. Those winters listed above all had an incredible likeness to each other despite being so different with temp extremes. Definitely a good blend of years with intent to capture the overall pattern which I'm in really good agreement with. 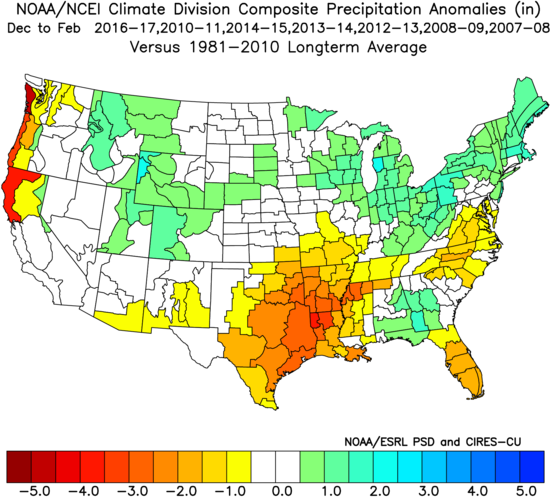 Warmer years of same or similar pattern being 2008 and 2012-13 and colder years being 2000-01 and 2010-11 for reference of the extremes here. Today's 00z CFSv2 flashing possible widespread Frosts to open Labor Day weekend up north??? Man this is nice looking stuff! Anytime i see 13-14 im excited. Im in the Siouxland area this weekend. Very nice weather right now but wanted to check in. Thanks for the updates. After a long range weather discussion with my neighbor yesterday, he believes that winter will be more harsh this year than last year, but, nothing of extreme measures. I.E, average snowfall in Detroit, MI is 44", so maybe more like 55-65". That is what he is looking at. I asked him if he can specify how and why he believes these numbers and he simply replied back by saying..."A gut Feeling"
That looks amazing. Ready for some 50/70 weather. Would be awesome to feel some non-humid air also. The JAMSTEC is in and it seems to be on the opposite end of where the other models are heading. Firstly, its showing a ENSO-Neutral (+) SST across the PAC. Based on current conditions in the equatorial PAC and where they are heading, I think it may be off its rocker. Yeah I'm not buying the warm neutral and nonexistent-warm PDO thing it has going. 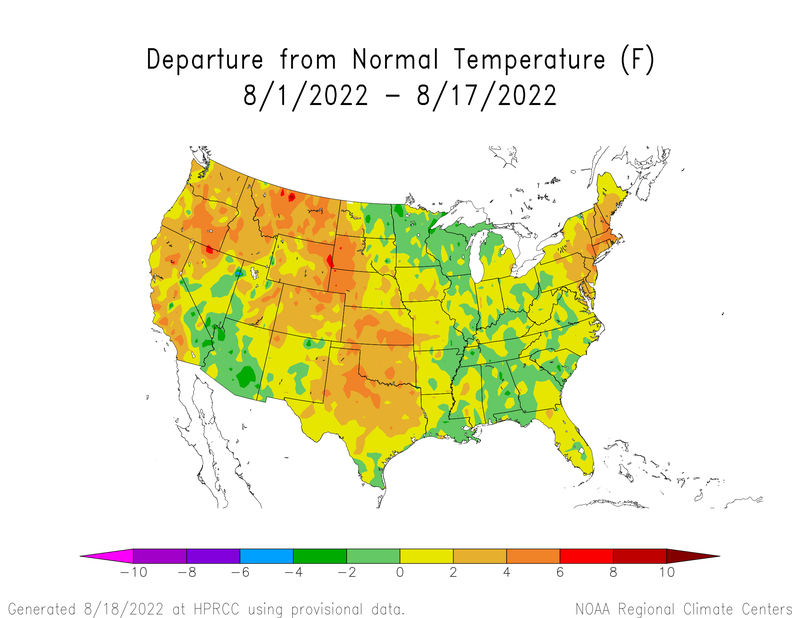 Temperature outlook seems on par, though. Not surprising really. At our latitude(s) it's really difficult to get below normal regime for more than a couple months. 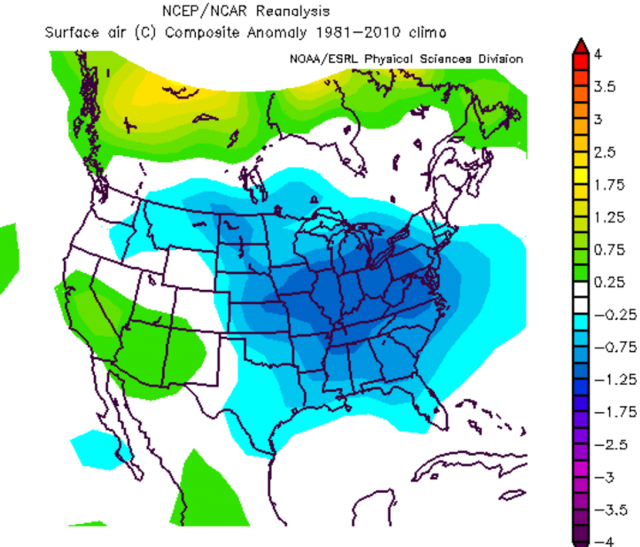 So, if you get a frigid Dec like some of the analogs are pointing to, you likely sacrifice February imho. Ofc, there are the (rare) exceptions, so the Euro could be wrong in the end. Loving the trends at this point though, and quite frankly, a couple months of solid winter is fine by me. Can always trek north on the front/back end of those two months to extend the season if I want to. Basically here, 2000-01 was all about late November to the NY. 90% of winter happened in those 6 wks. The action was hot-n-heavy but blew it's load so badly, that after the new year it was boring and the snow pack didn't get refreshed. I'd trade the all in one month plan for a more evenly spread winter. Yeah, if the sst are wrong in the model, have to assume the whole thing is. Gotta keep that ridge pulled south and west this winter or I will be watching you guys have fun while I get rain and ice all season long. If my thinking for this winter fails, that will be how it does it. Interesting, latest ECMWF Weeklies showing the early season dislodge of Arctic cold knifing down the central CONUS...been worried about this happening for Ag belt farmers.